This recipe has been around for years, and I've made it just about every year since I first discovered it. It's filled with the wonderful flavors of apples, squash, and curry, and is quite easy to make. The hardest task to this recipe is cutting the tough skinned acorn squash. But the presentation is beautiful and flavors are delicious, so well worth the effort of a single task! Melt 1 tablespoon butter in large skillet over medium heat. Add onion and saute until tender. Add 1 tablespoon curry powder, stir 1 minute. Add apples, apple juice, and raisins. Saute until liquid evaporates, about 6 minutes. Above filling can be made 1 day ahead. Cover and refrigerate. Melt 5 tablespoons butter in small skillet over medium heat. Add 1/2 tablespoon curry powder, stir about 1 minute. Transfer curry butter to bowl. Brush 2 large rimmed baking sheets with some curry butter. Arrange squash in single layer on sheets. Sprinkle with salt and pepper. Scoop filling into center of rings. Drizzle remaining curry butter over squash and filling. Cover with foil. 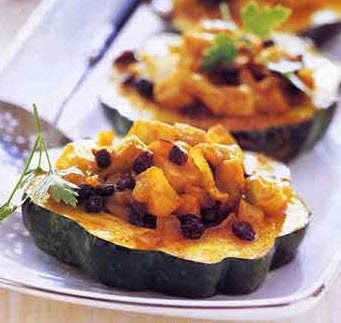 Bake until squash is tender when pierced with fork, about 40 minutes. Use spatula to transfer squash rings with filling to plates.